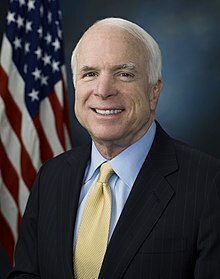 ^ McCain was christened and raised Episcopalian. See Nichols, Hans. "McCain Keeps His Faith to Himself, at Church and in Campaign", Bloomberg (April 25, 2008). He now identifies as a Baptist, although he has not been baptized as an adult, and is not an official member of the church he attends. See Warner, Greg. "McCain’s faith: Pastor describes senator as devout, but low-key" Archived 2009年3月18日, at the Wayback Machine., Associated Baptist Press (April 8, 2008). Retrieved September 6, 2008. Also see Hornick, Ed. "McCain and Obama cite moral failures", CNN, (August 16, 2008): "McCain, who was raised an Episcopalian and now identifies himself as Baptist, rarely discusses his faith." Retrieved August 16, 2008. Also see Reston, Maeve and Mehta, Seema. "Barack Obama and John McCain to Meet at Saddleback Church", Los Angeles Times, (August 16, 2008): "McCain [is] an Episcopalian who attends a Baptist church in Phoenix..." Retrieved August 16, 2008. ^ Man of the People: The Life of John McCain, p. 19, by Paul Alexander ISBN 0-471-22829-X. ^ Alexander (2002), p. 20. ^ a b Alexander (2002), p. 28. ^ a b c d e Timberg, Robert (1996). “Chapter 1: Halos and Horns”. The Nightingale's Song. Free Press. ISBN 978-0684826738. http://www.amazon.com/Nightingales-Song-Robert-Timberg/dp/product-description/0684826739. ^ James Carney (2008年1月23日). “The Resurrection of John McCain”. Time. http://www.time.com/time/nation/article/0,8599,1706450-3,00.html 2008年2月1日閲覧。 His IQ is given as 133. ^ a b c Alexander (2002), p. 32. ^ a b c d Timberg, Robert (1999) (paperback). John McCain: An American Odyssey. Touchstone Books. ISBN 0-684-86794-X. pp. 66–68. ^ a b Freeman, Gregory A. (2002). Sailors to the End: The Deadly Fire on the USS Forrestal and the Heroes Who Fought It. HarperCollins. ISBN 0060936908. p. 25. ^ Alexander (2002), p. 92. ^ Alexander (2002), p. 33. ^ Alexander (2002), p. 37. ^ Alexander (2002), p. 34. ^ a b McCain, Faith of My Fathers, pp. 185–186. ^ a b c Karaagac, John (2000). John McCain: An Essay in Military and Political History. Lexington Books. ISBN 0739101714. pp. 81–82. ^ Alexander (2002), pp. 39–41. ^ Timberg, An American Odyssey, p. 79. ^ R. Kaplan, "Rereading Vietnam", The Atlantic Monthly, August 24, 2007.